Any time you’re experiencing pain in your gums or teeth that won’t go away, it’s probably time to schedule an appointment with your dentist. Whether you know where the pain came from, like from an injury, or the pain came out of nowhere and its origins are a complete mystery, it’s important to have your dentist examine the area for any signs of a more serious issue with persistent pain. Chronic bad breath, or halitosis, may not seem like a big deal, but it could be a sign of many different health concerns, like dry mouth, conditions affecting the nose, mouth and throat, gum disease and even more complex systemic issues. The most common cause of halitosis is poor oral hygiene, but since it can indicate a more serious health problem, it’s important not to write it off, attempt to cover it up with mints or ignore it. Instead, turn to your dentist and ask them help you find the cause. Do your gums bleed when you floss or brush your teeth? Contrary to popular belief, this is not normal and should not be ignored. If your gums bleed regularly when you brush and floss, it’s typically a sign that you have gum disease. Left untreated, gum disease will only get more severe, leading to bone and gum tissue loss, sensitivity and even a higher risk for diabetes and heart disease. Sure, when it’s hot out and you haven’t quenched your thirst in a while, it’s normal to experience a little dryness in your mouth, but if you are experiencing dry mouth all the time, it’s important to visit your dentist. Though the cause of dry mouth could be anything from the medication you’re taking to smoking, dry mouth can lead to other oral health complications, like tooth decay, gingivitis and mouth infections, if not addressed and managed. Though the occasional canker sore is nothing to worry about, if you develop mouth sores frequently that don’t heal in 7 to 10 days, call your dentist for an exam. Mouth sores can be caused by many issues that can be easily corrected, like fake teeth that don’t fit properly, but they could also be a sign of oral cancer. 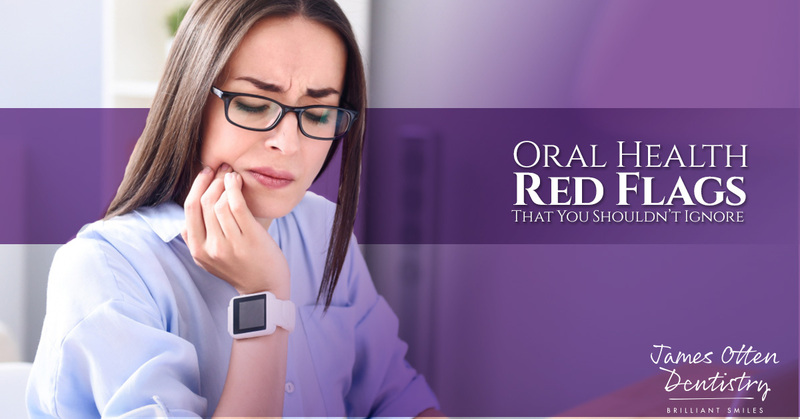 These are just a few of the many red flags that indicate the need for a visit to your dentist in Lawrence, but the truth is, any time you are experiencing anything unusual with your oral health, your best bet is to visit the dentist. When it comes to your oral health, it’s much better to play it safe. Schedule your appointment with James Otten Dentistry today.